The Kindred of Clan Ventrue have a reputation for being honorable, genteel, and of impeccable taste. 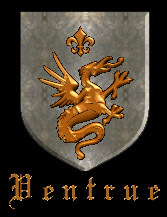 Since the foundation of the clans, Ventrue has been a clan of leadership, preserving order among the kindred of the world. Other clans mistake this for arrogance or avarice, but to the Ventrue, their role is more a burden than an honor. The Ventrue see themselves as nobles in the classical sense of the word, fighting to uphold the station of those below them. Reputation and achievement take a Kindred far in the Ventrue clan, but none of that counts if the vampire cannot maintain his influence. The Ventrue are known for their ability to persuade, and at this they excel. While their fighting abilities may not be up to par with all the clans, their ability to avoid a fight, and control their enemies makes them a more than formidable foe. Currently, the Ventrue of the Vampire Wars are a small clan, and are experiencing a rebirth of sorts. The requirements to gain advancement in the clan are strict, but new members learn that if something is worth having, it is worth working for.